THE seeds have been sown – now it’s up to you to help Downend and Bromley Heath’s colourful new look to take root. As reported in last month’s Downend Voice, concerted efforts to make our area look blooming great began with the planting of hundreds of daffodil and crocus bulbs. 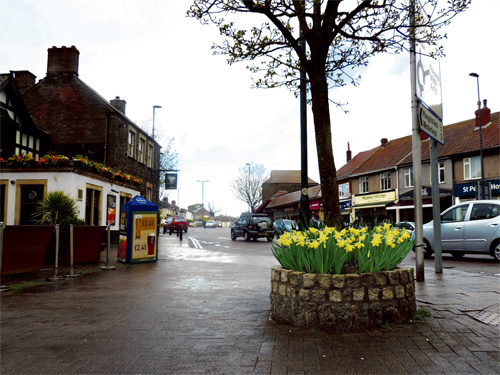 The roundabout in the village centre has been replanted, granite planters in the High Street have been upgraded and more planters and hanging baskets are planned to provide colour throughout the summer. This Downend in Bloom initiative has been led by Downend & Bromley Heath Parish Council, with help from South Gloucestershire Council Street Care. Downend Business Community and the High Street banks have pledged their backing but more support is needed so that the planting can cover the whole area. Parish councillor Chris Boulton wants to form a Friends group to raise funds and make the scheme sustainable and he would be happy to hear from anyone who can spare a few hours to help. Contact chris.boulton@dbhparishcouncil.co.uk or parish clerk Angela Hocking on clerk@dbhparishcouncil.co.uk, telephone 0117 956 7001.